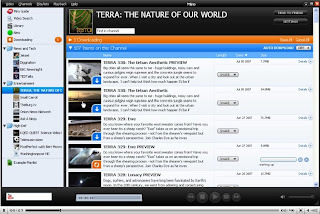 Miro is a free application for channels of internet video. Of course，if you talk about internet video service that remind you Youtube, but Miro is different it that cause the video's quality is much better than Youtube. Why? When you watch Youtube that play a live stream file, if your internet bandwidth is not very well the video will skip. Miro is a software that downloads videos completely before you watch, your videos will never skip or stutter while they are playing. In other words, if you are video hunter maybe Youtube is good for you, because the video update quick, and does not care about video's quality. If you want watch detail as like sitting front your PC for enjoying video, Miro is best one. You can pick thousands of free internet video channels that you can watch, it will download video automatically. It is free to download it, and watch high quality videos on your PC.